It’s one of the most beautifully-designed boats ever to come out of Annapolis: the wooden Trumpy Yacht. Less than 100 Trumpys are still on the water today. Now, the Annapolis Maritime Museum (AMM) is commemorating the yachts created at the city’s Trumpy Boatyard for more than 25 years in a new exhibit. The temporary exhibit is called “A Single Goal: The Art of Trumpy Yacht Building” and it opens next Tuesday, April 16. The exhibit shows off drawings, artifacts, and photos from current and former Trumpy owners and experts. The Museum will also display some items from its archives for the very first time. It focuses on a few special boats to show the wooden boat-building process and the Trumpy history. The boatyard operated in Annapolis from 1947 to its closing in 1974. Sigrid Trumpy, the granddaughter of Trumpy Yacht founder John Trumpy, Sr., curated the original exhibition with the help of historians, using her family’s archives and resources at Mystic Seaport, the Marion Warren Archives, the Chesapeake Bay Maritime Museum and AMM. Trumpy Yachts had a glamorous reputation, owned by the rich and famous. 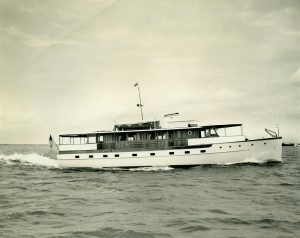 The best-known Trumpy was the former presidential yacht Sequoia. The exhibit will be on display until June 16.